The milestone that signifies the Owner’s public celebration of the completion of the project is the Day of Dedication more commonly known as the Ribbon Cutting Ceremony. 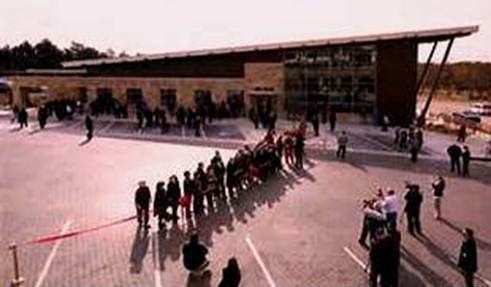 The ceremony inaugurates the official opening of a facility for its planned use. Amongst a hat trick of grand openings, the Visitor Center was dedicated along with the new Bedre Café and the ARTisian Gallery. All these facilities occupy the main Sulphur downtown intersection of First Street and Muskogee Avenue. 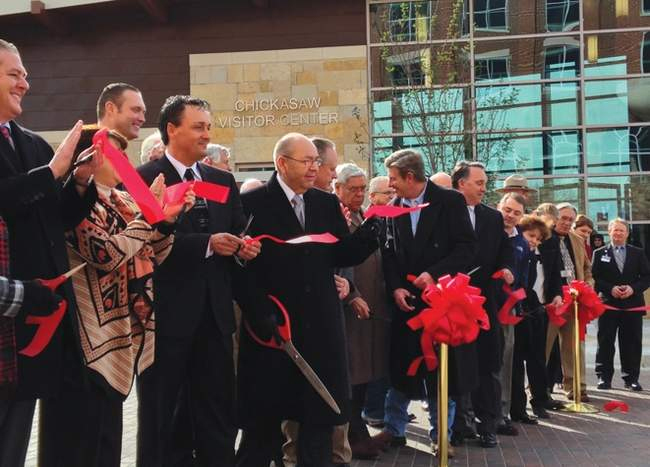 It is fitting that the 100th Post of the FSB Blog would celebrate this major milestone of the Chickasaw Visitor Center. The Artesian Hotel – northeast corner; a boutique hotel with spa amenities which includes on its street level retail arcade the Bedre Café, a chocolate lovers delight. Gateway Park – southwest corner; a pocket park providing open green space populated by Chickasaw art. ARTesian Gallery and Studios – northwest corner; a combination of a gallery and studios that house prominent Chickasaw artists in residence. The ceremony was conducted with a broad representation of dignitaries including Chickasaw legislators, State Representative, Choctaw Representative, Tribal Division Secretary, County Commissioner, Chickasaw ambassador at-large, tribal leaders, tribal members, national park representatives and Sulphur leadership and citizens. The event was covered by a number of news agencies that splashed the ceremony across the internet. The main presenting figure, however, was Bill Anoatubby, Governor of the Chickasaw Nation. While the governor is not a towering figure, through his mannerisms and words I always sense that I am in the presence of a true visionary. The Governor spoke of the Chickasaw Nation’s commitment to partnering with area communities to promote job growth and tourism that will enhance local, tribal and state economies. He referred to the Visitor Center as a gateway to Chickasaw Country that welcomes visitors and encourages them to discover the beauty, history and hospitality of the region.The Visitor Center has opened its arms to the public and can now begin to fulfill its mission in earnest. 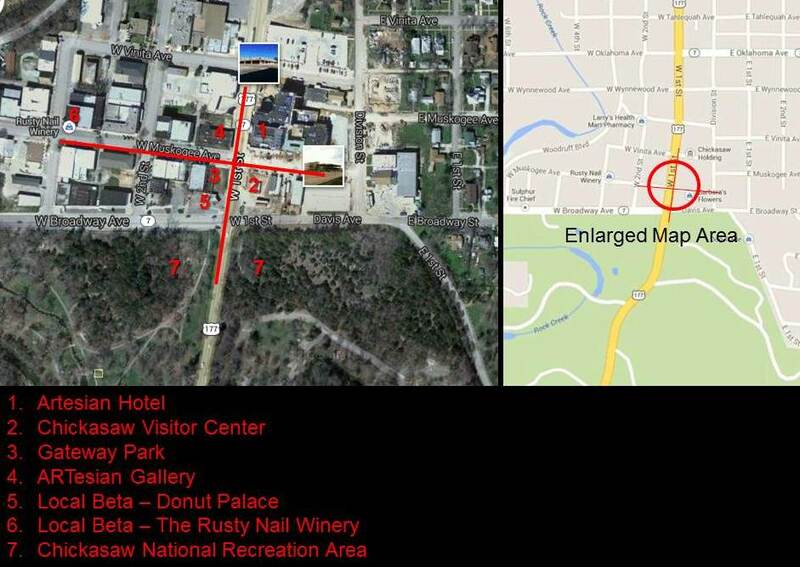 It was on June 17, 2011 at the inception of the project that the FSB Team held a Visioning Workshop with key stakeholders of the Chickasaw Nation and a Mission Statement was crafted to act as a beacon in guiding the development of the Visitor Center from that point forward. Even though the facility is now open to the public and fulfilling its mission, the public is unaware of the fact that there are still activities going on behind the scenes to both technically and contractually close-out the project. Still ahead are the gathering of record documents, operations and maintenance manuals, systems training and commissioning, final inspections and final payments. The following news stories were some of those published covering the ribbon cutting event. [cid:image001.jpg@01CBCC37.F0752DF0] FRANKFURT SHORT BRUZA ASSOCIATES, P.C. Fred, thanks for being a faithful follower. We’re about at the end of the road on this one. Cecelia (hope that’s right); Thank you for your great comments and for visiting the FSB Blog. Regarding your question, some years ago I found a book that was very helpful on brainstorming your ideas getting ready for writing. The book is titled Writing the Natural Way by Gabriele Rico. it is about using right-brained techniques to release your expressive powers. Even before that I spend time doing research and time planning the article (often while I’m driving) and then use a quiet space to begin pluttng it all together. While I’m planning other ideas pop into my head either regarding the current article or about another article. I keep a notebook to jot those down for future reference. Hope that helps. Good Luck, Fred.